Will Wallace snag a Ryder Cup place? The finish to the Made in Denmark on Sunday afternoon was really quite incredible. Ryder Cup Vice Captain and 54-hole leader, Lee Westwood, had looked far and away the most likely victor when he birdied the 11th to get to four-under-par for his round and he was matched at a low of [1.14] but a stuttering finish, that saw him play the final seven holes in one-over, opened the door ajar and we finished up with a four-man playoff. Jonathan Thomson, who hit a low of [2.16] in-running, matched Westwood's -19 total, along with Steven Brown and Matt Wallace. The latter had looked as dead as a doornail when he trailed by six after Westwood had birdied 11 but he produced a most remarkable finish. Wallace had been my pick before the off at [38.0] as well as Mike Norman's each-way fancy and I think we'd both given up on him early during his final round after he'd played the first four holes in two-over. He rallied well around the turn but when he failed to birdie the par five 11th and bogeyed the short par four 12th, he really did look dead in the water and he was matched for pennies at [1000.0] but he rallied spectacularly, playing the last six holes in five-under-par, with birdies at the last three holes! Brown was matched at low of [1.4] after his approach to a couple of feet at the first extra hole but Wallace holed his birdie from about six feet before him and Westwood and Thomson were both eliminated when neither couldn't match Brown and Wallace's birdie threes. Brown hit the better drive at the second extra hole but Wallace played his second shot to almost the exact spot he had at the first extra hole and when Brown failed to make his lengthy birdie attempt Wallace rolled in his seventh birdie in eight holes to win his third European Tour title of the year and his fourth in 16 months. Opinions are divided as to whether Wallace should be a Captain's pick for the European Ryder Cup team and he's been matched at as high as [5.7] and as low as [1.7] in the Qualify for Team Europe market. For what it's worth, I think he deserves a pick and I think Bjorn will think the same. A precedent was set when Edoardo Molinari, in 2010, and Thomas Pieters, two years ago, were both granted Captain's picks after they'd won a couple of tournaments just before the announcements were made and I can see Bjorn granting Wallace one too. It's ridiculously tough to call though, with the likes of Ian Poulter, Henrik Stenson, Paul Casey, Sergio Garcia, Rafa Cabrera-Bello and Pieters all in contention for the four places and whichever way the Dane goes, praise and criticism will fly in almost equal measures. The finale to the Dell Technologies Championship was a far more serene affair with Bryson DeChambeau taking control before the turn with birdies at seven, eight and nine. Bryson had been matched at [500.0] for a couple of pounds after a slow start and he sat tied for 20th and still seven off the lead at halfway before making his big move in round three with an eight-under-par 63. Australia's Cameron Smith got to within a stroke of the winner after birdying 15 and 16 and he hit a low of [4.2] but DeChambeau responded immediately with a birdie of his own at 15 before going on to win by a couple of strokes over first round leader, Justin Rose. It's been a lovely week with both winners backed before the off - Wallace at [38.0] and DeChambeau at [42.0]. I was playing cricket on Sunday so I didn't get to watch the final round in Denmark live and, having watched the early play, I was amazed to see Wallace was in a playoff after I'd finished fielding. I layed him back at [1.35], without knowing what was going on, just as I was going in to bat but I needn't have bothered. I never mind giving a bit back laying picks at odds-on and I layed DeChambeau back at [1.6] as he played the ninth. It's been a great year and one to remember and this was the second time in four months that I'd picked out the two winners before the off. Wallace was involved the first time too, when he won the BMW European Open and Bubba Watson won the Travelers Championship. Bjorn's home course, the Silkeborg Ry Golfklub made for a fabulous new venue for the Made in Denmark but given we're returning to the Himmerland Golf and Spa Resort in Farsø next year, there isn't much point in looking back at the event in depth but we did get another typical European Tour Sunday. Three players traded at odds-on and as there so often is on this Tour, there was all sorts of drama as the winning line drew closer. 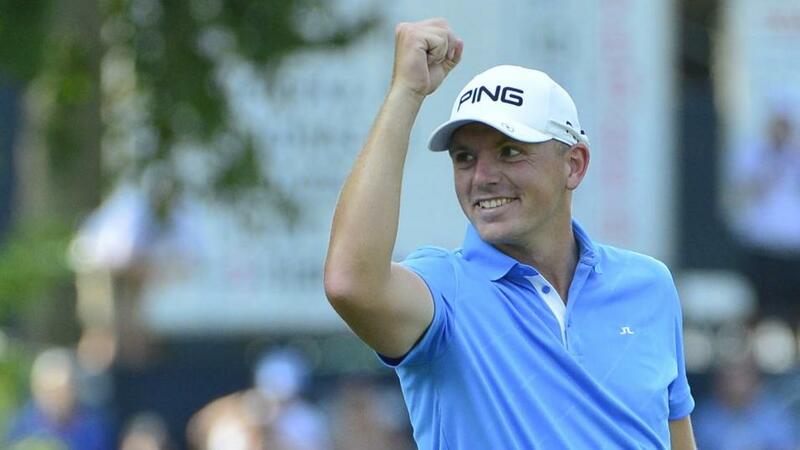 Laying long odds-on jollies often pays dividends on a Sunday on the European Tour and it did again last week. Over at the Dell, DeChambeau became the ninth player to win two FedEx Cup Series events in the same year and he's the sixth player to win back-back Series events. That's an incredible number given the Series is only in its 13th year and it's a trend I'll continue to follow. Vijay Singh won the first two tournaments ten years ago and Camilo Villegas won the third and fourth so whoever wins next week's BMW Championship might be worth following at East Lake at the season finale. No player has won three Playoff events in the same year but I don't think you can write off Bryson. Breaking conventions is what he does best. I'll be back shortly with my Omega European Masters preview and later today or tomorrow with my BMW Championship preview.